I'll be posting more photos here when I get back from our vacation on the Erie Canal. Back from vacation and we had a great time. The people at Mid-Lakes Navagation gave us a nice canal boat in great condition and the trip was relaxing with lots of good places to eat on the canal. We got a lot done in the last 4 days. 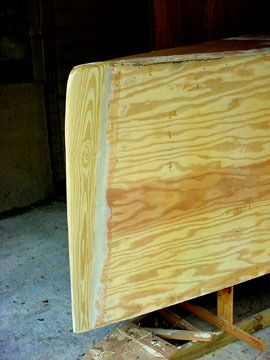 All the plywood is now on the hull. The second layer of 3/4 on the bottom used a lot of epoxy. We are filling all the screw holes with epoxy and sanding everything down in preperation for the xynole cloth. I will make the outer stem this week while we wait for Defender to ship the cloth. Lots of good comments on our progress. I am borrowing the digital camera from my Dad to take the pictures you see here so hopefully I'll post in the next day or two. Work on the stem this weekend. Filled all the screw holes in the bottom with epoxy but we still lack the holes on the sides. Also worked on the joints between the panels on the sides. There is quite a bit of fairing to do but it should pay off later. If I had to do it all over again I would suggest scarphing the plywood so as to avoid this step. Also, there is a LOT of sanding to be done on a boat this size. Debbie is getting very good with the orbital sander. Good News!! Defender finally delivered the Xynole cloth to cover the hull. 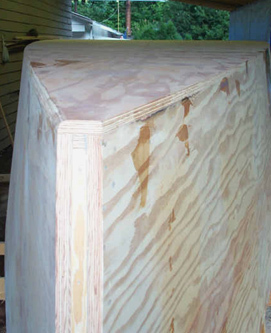 This cloth is stronger than fiberglass cloth and not as hazardous to the boatbuilder. Now all I need is a little more sanding time. We will be glad when the hull is done an we get a break from mixing large batches of epoxy. 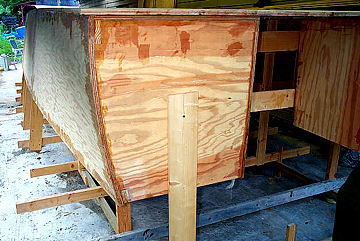 Transom with the plywood on. We have been working for a few hours in the evenings doing what else, sanding. The hull is almost ready to put on the xynole. We are trying to get it as smooth as possible to avoid too much fairing and sanding after the cloth is on. I bought a straight line sander like the body shop guys use and it is saving lots of time getting the joints smooth and flush. I wish I had thought about getting one of these tools sooner. We should finish sanding the hull this weekend and put the cloth on next week. We got the first run of cloth on the bottom Sunday. 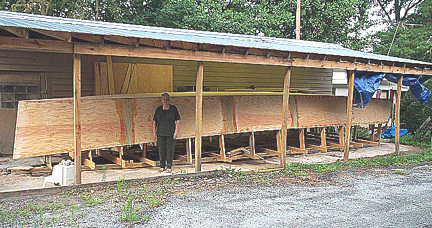 Because the boat is so long we decided to put a 60" strip down the middle of the bottom first and do the rest of the bottom and sides out of the next 60" on each side. This will leave us with the least amount of wasted cloth. It was about 90 degrees in the shade when we started the epoxy and our working time was 30 minutes per batch. We worked quick enough that we didn't loose any epoxy. After the initial coat was tacky we went back and rolled on a second coat to fill the weave of the cloth. Later that night we check the finished product and found it had the texture of 50 grit sand paper. I checked with Mark and he had the same results with his boat. We will get the rest of the hull covered this weekend and fill the rough spots with epoxy and talc then its on to more sanding and painting.